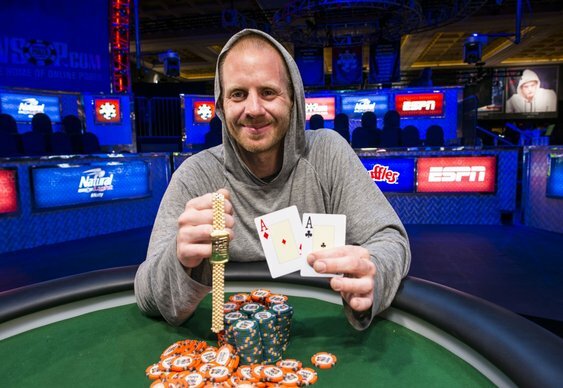 No World Series of Poker would be complete without a true rags to riches story and the one on offer in this year's Ante only is a corker. Jesse McEuen turned up in Vegas this year with just $1000 in his pocket, was sleeping in his car rather than a swanky hotel and only had his pet dog for company. It was all a far cry from his days as a highly successful online pro. Good enough to reach Supernova Elite level, McEuen was hit hard from the fallout from Black Friday and lost the lot. Perseverence paid though, with the help of British bracelet winner John Kabbaj. The pair had played together at the PLO cash tables at previous WSOPs and a chance meeting this year proved life-changing. The longer they spoke, the more Kabbaj realised that they had in common. The upshot being that the British bracelet winner decided to help someone down on his luck by buying him into a few tournaments. McEuen busted the first two without success, but hit paydirt in the third, besting a 714-runner field in the $1,500 Ante Only Event to take his first bracelet and a $212,093 score.